Wayne Stiles explores the 8 (present) and 12 (future) gates of Jerusalem. Ferrell Jenkins shares some beautiful photos and helpful information about the Citadel of David in Jerusalem. David Hansen provides an introduction to the significance of biblical geography that could be useful in many Bible classes. Note, in particular, the two important questions he suggests. Jennifer Ristine, coordinator of the Visitors Center at Magdala, provides an explanation of the various symbols on the Magdala Stone. A 1500-year-old copy of the Ten Commandments is being auctioned off by the Living Torah Museum. There’s more here. The Toledo Museum of Art is selling part of its Egyptian collection. Five Dead Sea Scroll fragments have been put up for sale. On November 15 in London, Sotheby's is auctioning rare and early photo albums of the Holy Land, including a rare hand-coloured subscriber’s copy of David Roberts’s Holy Land and Egypt. The Israel Antiquities Authority has issued a press release with an accompanying video (below) describing a rare papyrus dating to the time of Judah’s monarchy and mentioning the name of Jerusalem. The two-line document measures 4 inches long and 1 inch tall and describes jars of wine shipped to Jerusalem. It was written by a high-ranking female official in the time of Kings Manasseh or Josiah. The papyrus was discovered by antiquities thieves working in a cave in the Judean wilderness. “This is a rare and original shipping document from the time of the First Temple, indicating the payment of taxes or transfer of goods to storehouses in Jerusalem, the capital city of the kingdom at this time. The document specifies the status of the sender of the shipment (the king’s maidservant), the name of the settlement from which the shipment was dispatched (Na'arat), the contents of the vessels (wine), their number or amount (jars) and their destination (Jerusalem). Na'artah, which is mentioned in the text, is the same Na'arat that is referred to in the description of the border between Ephraim and Benjamin in Joshua 16:7: “And it went down from Janohah to Ataroth, and to Na'arat, and came to Jericho, and went out at Jordan”. “According to Dr. Eitan Klein, deputy director of the IAA’s Unit for the Prevention of Antiquities Robbery, “The document represents extremely rare evidence of the existence of an organized administration in the Kingdom of Judah. It underscores the centrality of Jerusalem as the economic capital of the kingdom in the second half of the seventh century BCE. According to the Bible, the kings Menashe [Manasseh], Amon, or Josiah ruled in Jerusalem at this time; however, it is not possible to know for certain which of the kings of Jerusalem was the recipient of the shipment of wine”. The full press release includes more quotes from senior officials. One assumes that the cave where this papyrus was discovered was thoroughly searched, but no additional fragments were found. Even so, it surely increases hope that more such ancient documents are preserved. Hopefully the IAA will get ahead of the thieves by conducting more excavations. With a tantalizing discovery like this one, I suspect that the public might be willing to support it financially. I’m trying to think of other papyrus fragments from the time of Jerusalem’s destruction in 586 BC and earlier, and none are coming to mind. The press release does not mention any. If this is unique in that regard, this discovery is all the more remarkable. The reports in the Times of Israel and the Jerusalem Post include various photos. UPDATE: Christopher Rollston believes the papyrus may be ancient but the writing a modern forgery. Joseph Lauer has alerted us to high-res photos available here. Archaeologists have uncovered evidence of the Roman breach of Jerusalem’s “Third Wall” in AD 70. Some high-res images are available here. Excavations around the “Ramesses Gate” in Jaffa have revealed a massive destruction layer that attests to a battle between Egyptians and Canaanites. Researchers have discovered two secret chambers in the Great Pyramid of Giza. The Temple Mount Sifting Project shares some finds related to the feast of Sukkot. Scientists have recently discovered the two components that gives frankincense its distinctive odor. An archaeologist has created a 3-D model of the Heraion at ancient Olympia using photogrammetry. An AP article describes the work and accomplishments of Robert Bewley and David Kennedy in documenting archaeological sites in Jordan from the air. The New York Times profiles the early farming village of Ain Ghazal in central Jordan. A new pleasure cruise line is carrying travelers between Haifa and Acco. The National Museum of Beirut has opened its basement to the public for the first time in 40 years. Touch Point Israel has compiled a list of 13 “must-see museums” in Israel. Progress is being made on the National Campus for the Archaeology of Israel. The Jewish Press article includes photos and a 2-minute video. According to UNESCO, the Temple Mount in Jerusalem has nothing to do with Judaism. Carl Rasmussen shares several photos from one of the least visited places in Jerusalem, the Tomb of the Royal Steward. Wayne Stiles looks at the ancient and modern significance of Gideon’s battle in the Harod Valley. The Associates for Biblical Research are having a big sale on the complete archive of Bible and Spade. The schedule for next month’s Bible and Archaeology Fest XVIII is now online. Word is out about a ancient papyrus to be presented next week by Shmuel Ahituv. The Hebrew papyrus includes the word “to Jerusalem,” and dates to about the time of King Hezekiah. It was discovered recently in the Judean wilderness and purchased from an antiquities dealer. For information about the conference, see Aren Maeir’s post and his mention of this “VERY INTERESTING” papyrus. UPDATE (10/22): The now-deleted reference to the number of lines on the papyrus was based on the mistaken assumption that the article’s photo showed the newly discovered papyrus. At the end of last week, after a lengthy delay, we were happy finally to get our grubby mitts on Lawson Younger’s newest book, A Political History of the Arameans: From Their Origins to the End of Their Polities (Atlanta: SBL, 2016). Lawson Younger is a professor at Trinity Evangelical Divinity School, and I have had the pleasure of taking several of his classes during my sojourn in Illinois. I am not sure when he began work on this volume. I do recall attending a seminar that he first offered in the fall of 2006 entitled “Arameans and the Bible.” Since then, Younger has published a handful of book chapters and articles dealing with the Arameans and he has given several lectures on the subject. Now, 10 years later, that initial course has morphed into a two-inch-thick book. This is a technical work packed with data and analysis—it is not fluff reading. Bible students will find much of interest in its pages, for Younger treats all biblical references to Aram/Arameans, beginning with the Patriarchs through the divided monarchy. But he does much more than that, covering Aramean kingdoms and entities that receive no biblical mention but that are attested in the textual and/or archaeological record of the Near East. It is quite an impressive accomplishment. Due to the nature of the sources, a good portion of the book is told from the perspective of the Assyrians as they campaigned to the West. There are over 100 maps, illustrations, and tables sprinkled throughout the chapters (we are quite fond of the maps). You should find that this volume will satisfy all of your Aramean-history needs, and at 857 pages, it should satisfy them for some time. This volume presents a political history of the Arameans from their earliest origins at the end of the Bronze Age to the demise of their independent polities. 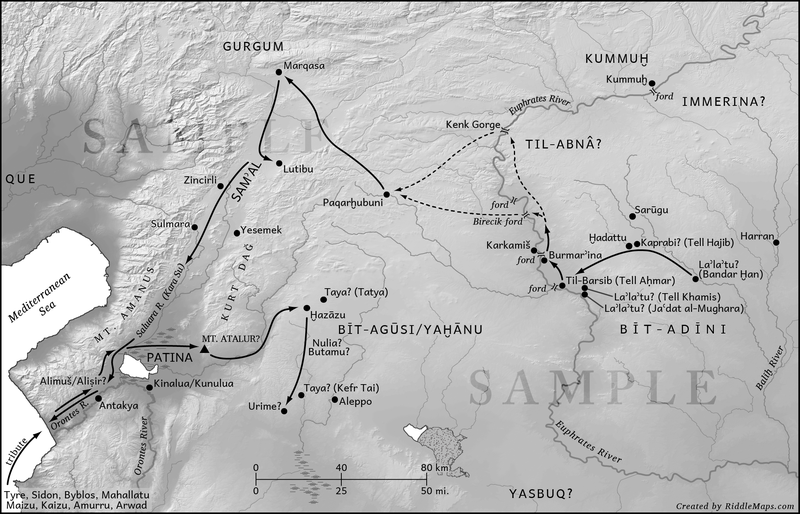 Employing the most recent understanding of tribal political structures, aspects of mobile pastoralism, and models of migration, K. Lawson Younger Jr. takes a regional approach to explain the rise of the Aramean political institutions. 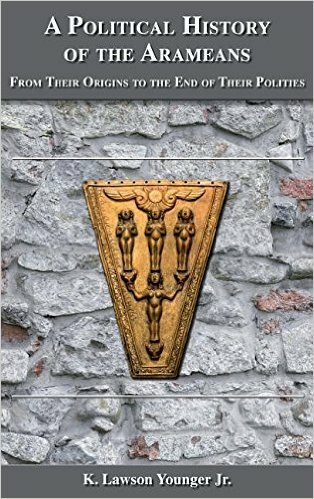 He thoroughly explores the complex relationships and interactions of the Arameans with the Luwians, the Assyrians, and the Israelites. By drawing on all available sources—sociological, textual, and archaeological—Younger is able to develop a comprehensive picture of this complex and important people whose influence and presence spanned the Fertile Crescent during the Iron Age. A Political History of the Arameans can be purchased in hardback ($118) or in paperback ($98). (Apparently, SBL has chosen to opt for European publishers' pricing on this title which is too bad.) Below is the table of contents. Side note: For a treatment of the Aramean oppression of Israel from the Israelite perspective, I recommend this work. An ancient Christian “crossword puzzle” has been discovered in the agora of Smyrna. A sewage system in the Urartian city of Van that dates to 800 BC has been fully excavated. You missed the first-ever “Swim the Corinth Canal” event, but perhaps you can join next year. Greece’s National Archaeological Museum is celebrating its 150th anniversary. At the ASOR Blog, the executive producer of a new documentary about Gertrude Bell provides some background. You can also watch the trailer. New paper at Academia: “Computer Experiments on the Khirbet Qeiyafa Ostracon,” by Eythan Levy and Frédéric Pluquet. Nigel Fletcher-Jones considers the ethical problem of the public display of mummies and alternative approaches. A French-Egyptian citizen turned over a golden mummy mask to the Egyptian government. The November/December issue of Biblical Archaeology Review is now online. I made it into Wayne Stiles’s post this week about the Dead Sea Scrolls. Check out the great quote by Frederic G. Kenyon. Shmuel Browns shares a couple of photos he took at Machtesh Qatan. The extraordinary Bible collection of the late Charles Ryrie is being auctioned off by Sotheby’s. UPDATE: Next weekend’s roundup will be delayed by several days. A couple of Israeli scholars are suggesting that the Hasmonean Hall (aka “Hall of the Freemasons”) in the Western Wall Tunnels may have served as a triclinium for Jerusalem’s city council. Scientists working in Galilee have discovered caves used by rebels in the Jewish Revolt. For a more academic study, see this journal article. The eastern temple of Ramses II at Karnak has been opened after restoration. Excavations at Petra have revealed new information about the water systems that kept the city alive 2,000 years ago. Municipal workers in Turkey's Çanakkale province discovered gold jewelry in an 8th century BC sarcophagus. Russia is sending a team of scientists to investigate World Heritage sites in Syria allegedly destroyed in the civil war. The Basrah Museum is opening soon in a former palace of Saddam Hussein. The Archaeological Museum of Kos re-opened up last month after renovation. A competition is being held for the architectural design of the new Cyprus Museum in Nicosia. The International Criminal Court in The Hague has ruled that destroying cultural antiquities is a war crime. Wayne Stiles’s new post on the history and significance of Eilat is filled with lots of photos I really like. Ferrell Jenkins shares a photo of a beautiful sunrise over the Sea of Galilee. Haaretz reviews the best of archaeology in Israel this past (Jewish) year. John S. (Jack) Holladay died last week. He was a long-time professor at the University of Toronto and he was involved in excavations at Gezer and in the Wadi Tumilat Project.